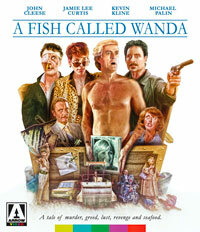 The late 80s produced some great and memorable comedies, and, without a doubt, A Fish Called Wanda is one of the most recognizable and beloved achievements of the genre at the time. Released multiple times on DVD and Blu-Ray Disc before, Arrow Video is now bringing fans a Special Edition that is not only featuring the film itself, but also a host of bonus features. Eagerly, I dug into the whole package. Pulling off what seems to be an incredible bank heist, a group of London robbers just stole millions of pounds worth of jewelry. They stash the loot in a garage where they want to let it rest until the heat is off, at which time they plan to safely retrieve it and begin the rest of their lives. But not one of the robbers trusts the other—and rightfully so. Wanda (Jamie Lee Curtis) and Otto (Kevin Kline) are in it to scam everyone else. 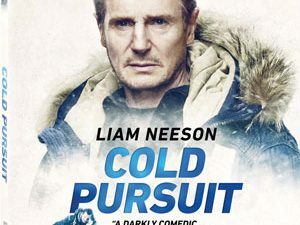 They give up ringleader George (Tom Georgeson) to the police, intent on using his disappearance behind bars to grab the loot for themselves and vanish to some faraway part of the world. But when they visit the garage, the loot has disappeared. Anticipating the move, and perhaps trying to pull the same stunt, George actually moved the jewelry and gave the key to a safe deposit box, where it is now stored, to his co-conspirator Ken (Michael Palin). Trying to find out where the loot is hidden, Wanda befriends Archie Leach (John Cleese), George’s lawyer, in hopes that he may get George to give up the location. …and as things spin out of control more and more, the entire plot escalates and everyone is double-crossing everyone in hopes of finally getting their hands on the riches. 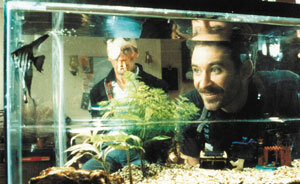 Funny doesn’t even do justice to A Fish Called Wanda, because the movie is really more like all-out-funny or constantly-hilarious. It is a masterful example of how incredible writing, devious plotting, and a disproportionately talented cast can result in pure comedy gold that lasts for decades, because even today, 30 years after its making, A Fish Called Wanda has yet to be surpassed by any heist comedy. It is funny, surprising, hilarious, and outrageous on every corner—simply beautiful. It would be easy to say, yeah, it’s got John Cleese in it, so it must be funny, or Michael Palin made the movie, or Jamie Lee carried it, but, no, that’s not at all true. The great thing about A Fish Called Wanda is that you can’t really pinpoint any one thing, any one plot point, any one scene or any one cast member that makes it so successful. It is the whole that works so well—all of them working together so miraculously. Arrow Video is presenting a beautiful 1080p high definition transfer of the movie on this release. During the opening credits, the transfer shows a bit of grain, as a result of the optical printing of the titles, but once these titles are over, you are greeted by a meticulously cleaned up presentation that is free of blemishes and revels in details and colors. Blacks are deep and help root the image with visual depth and shadow detail. I should point out that this is truly a brand-new transfer, prepared from the original camera negative, specifically for this release, and it shows. 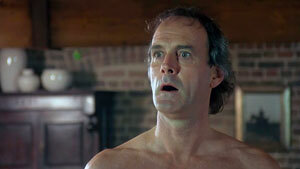 Naturally, the release also includes a series of bonus materials, starting with a Commentary Track by writer and star John Cleese. The track is as witty and insightful, just as you’d expect, and it is complemented by an Introduction by John Cleese. The 1988 documentary John Cleese s Final Farewell Performance is also included featuring interviews with actors John Cleese, Jamie Lee Curtis, Michael Palin, Kevin Kline and director Charles Crichton, and you will also find the 15th anniversary retrospective documentary, Something Fishy , on the disc, featuring interviews with Cleese, Curtis, Kline and Palin, executive producer Steve Abbott and director of photography Alan Hume. Fish You Were Here is a documentary on the film’s various locations. In addition, the disc contains twenty-four deleted and alternate scenes with introductions by John Cleese, a photo gallery, trivia track, and trailers. 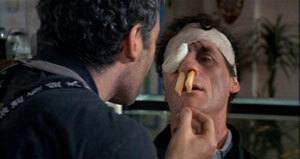 A Fish Called Wanda is a film that has effortlessly overcome time and space and remains as funny as it was on the first day. With this new Special Edition and this brand new transfer, Arrow Video is releasing what could be considered the ultimate version of the film, so make sure to grab your copy as soon as you can!